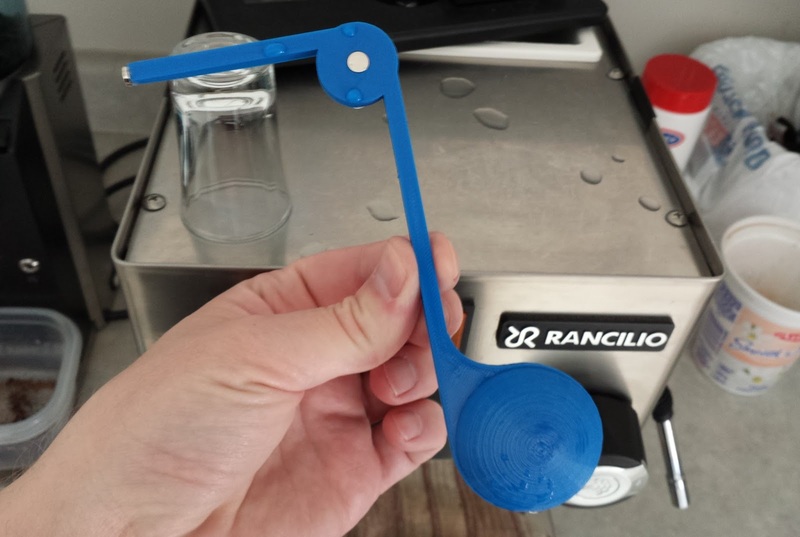 I have yet again redesigned my low-water sensor for my Rancilio Silvia espresso machine. It is a great machine, but it is impossible to see into the water tank and I always forget about it until a brew is ruined by low water. This is what you see when water is low: you will begin a brew and the LED right in front of you will begin to blink. When you refill the water, the blinking will stop. It uses no power at all when it is not in action. Note: This is a newer version and followup to my previous version of a low-water sensor. The previous version worked great but I had two problems that could not be ignored. First, the tilt sensors I used are not super reliable. The other problem is that the floater is troublesome. Waterproofing with silicone sealant is only so-so and is also a messy process. 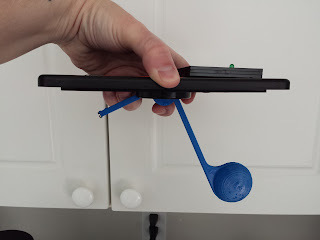 I thought of casting my own floater out of a food grade silicone with the tilt sensors embedded inside, but before I began that I had a better idea. It always bugged me that my sensors required a hole to be made in the water reservoir lid. But I had a solution to that too and killed two birds with one stone. Here is the newest version: the "floater" part is bigger but this design requires no hole in the lid! It is perfectly accurate and completely non-destructive! The blue section is 3D printed (I used 3dhubs.com to find a local printer) and works through the plastic of the lid. With the help of a magnetic interface, the new system requires no permanent changes to the coffee machine! I have always been a big proponent of developing an idea by prototyping as much as possible and this is no different. I think I finally have something I am happy with. Even so, this is still only a prototype. If I want only the one it would be fine but if I wanted to make this a product or kit then I'd have more work to do. This version is great but it needs more work - things need to be smaller, have a cleaner look, be easier to make, and also use only food-safe materials. But I think I finally have something I am happy with. The next version will be refined but I think the most important design parts are done.